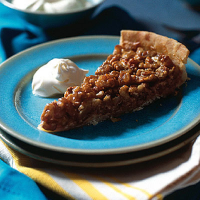 If you can find wet walnuts with their fresh, milky texture, this tart becomes a rare treat. Otherwise, use the youngest walnuts you can, soak them in hot water for an hour and rub some of the skins off with a tea towel before using. Serve with crème fraîche. For the pastry, cream the butter and sugar, mix in the egg and sift over the flour, cornflour and a pinch of salt. Knead very lightly until just combined, shape into a log and wrap in clingfilm. Chill for 45 minutes. Cut the pastry into ½cm-thick discs, then lay over the base of a round, fluted, 23cm loose-bottomed tart tin, overlapping them slightly. Using your fingers, press the pastry discs together to cover the base and sides of the tin completely, trimming the edge to neaten. Chill for 30 minutes. Preheat the oven to 180°C/gas 4. Line the pastry case with non-stick baking paper and baking beans, place on a baking sheet and bake blind for 15 minutes. Remove the paper and beans and cook for a further 5 minutes, until very pale golden. Meanwhile, make the filling. Either chop the nuts by hand or use a food processor, pulsing until roughly chopped. Whisk the butter, flour, honey and sugar together to combine. Mix in the eggs, a little at a time, followed by the walnuts and sherry. Spread evenly over the pastry case. Bake for 20 minutes or until almost set with a slight wobble in the centre. Cool for 15 minutes, then carefully remove from the tin. Slice and drizzle with a little more honey. This autumnal tart needs an assertively rich wine partner. Burnished Australian muscat is ideal.